It's simple. Ticket holders unable to attend an event can donate tickets to MVK in a matter of minutes by logging on to our website. Tickets can be submitted after completing a one-time registration providing a donor password. All ticket donors are automatically issued a receipt for their tax deductible donation. The MVK website also serves as a location for qualified, non-profit organizations to receive donated tickets. All non-profit agencies must be tax-exempt agencies that benefit underserved kids ages 18 and under. All of our recipient agencies are pre-screened prior to being accepted into our program. More than Tickets: MVK has built a network of community sponsors, business leaders and individuals that allow us to do more than provide tickets. Together, we provide at-risk kids with unique experiences that have the potential to change their view of their world, their future, and themselves! Do you have an idea for how you or your business could host an event or enhance a cultural or sporting experience for MVK kids in our community? Contact us at 513-484-3017 and join us in making a kid smile! Cincinnati Pops Orchestra provided several young kids with the opportunity to learn about music through the Lollipop Family Concert: Carnival of Animals! 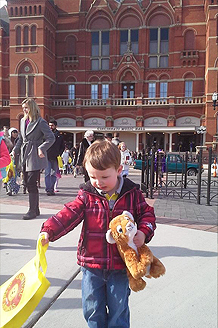 There is nothing like taking your best stuffed animal to a morning concert at beautiful Music Hall! Thanks Pops!